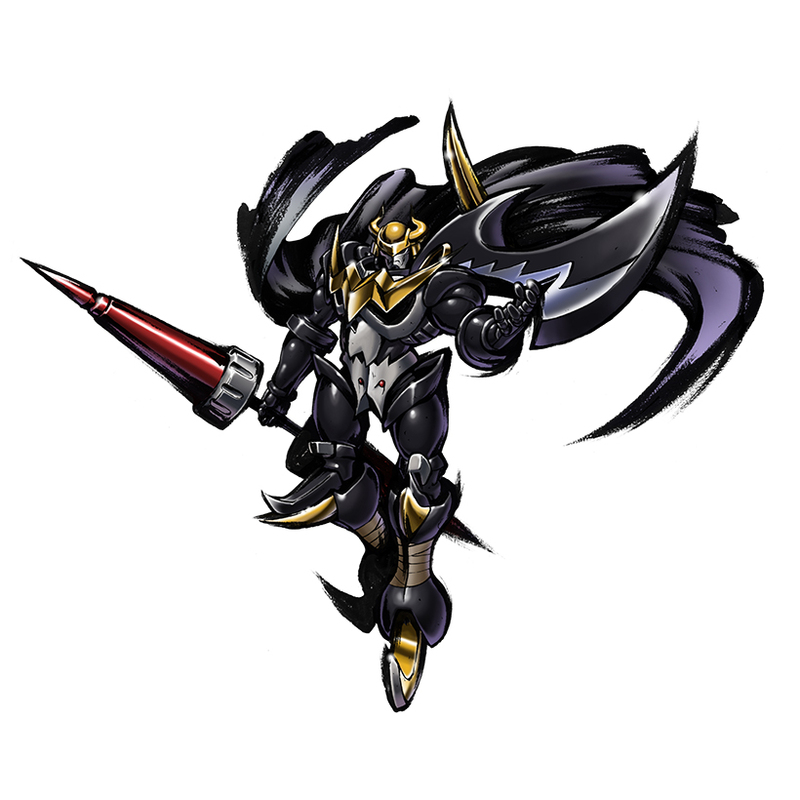 Dark Knightmon is the fused figure of Skull Knightmon and Deadly Axemon, who have exchanged cups of brotherhood. 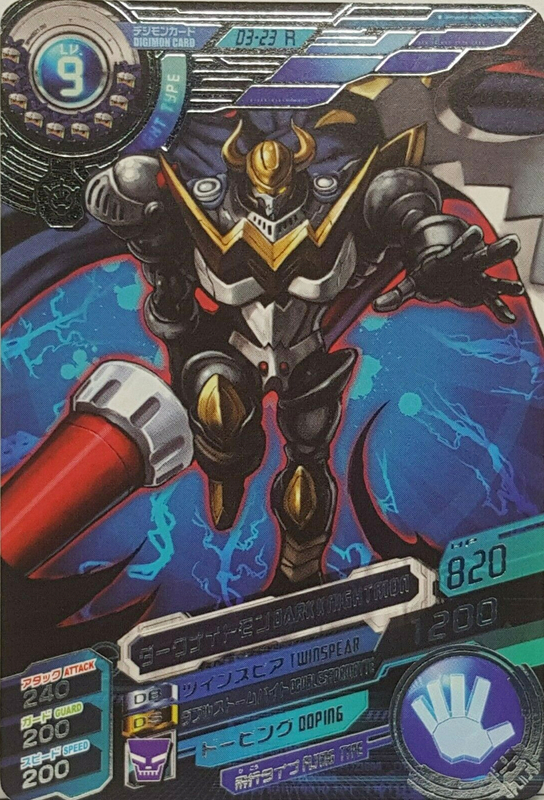 Dark Knightmon, who brings the older brother's ingenuity together with the younger brother's mobility, has become a first-class warrior. 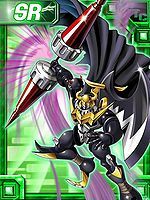 The skills of Dark Knightmon, who can use the "Twin Spear" it wields to thrust, slash, sweep, or throw as the situation calls for, are very advanced, and it is said there are few people powerful enough to fight Dark Knightmon fairly to its face and defeat it. 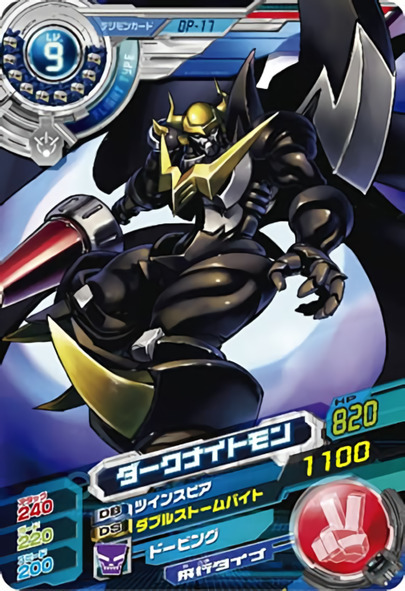 While Dark Knightmon possesses that much competency, it will use any means to achieve its goals and won't hesitate to get its hands dirty, and sometimes it will even be willing to betray its own comrades. 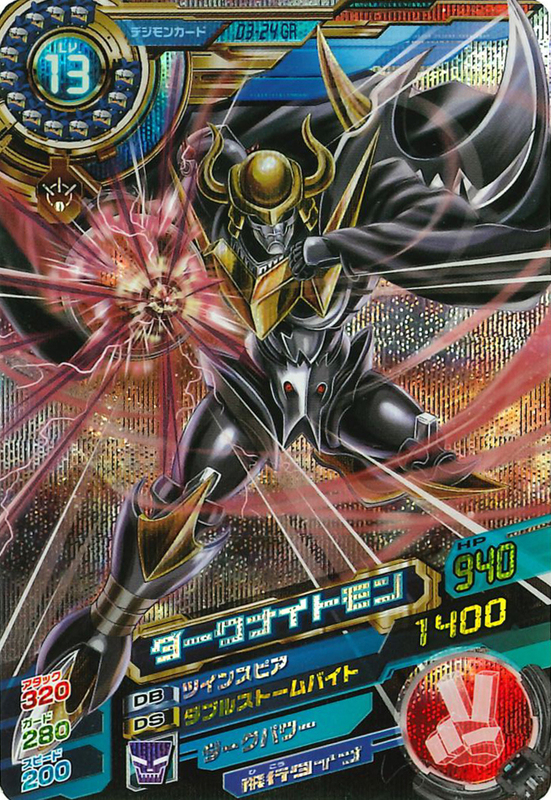 Dark Knightmon, who is furnished to an implacable depth with merit, is an opponent that you don't want to turn into an enemy, if you can help it. 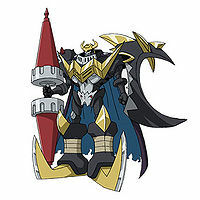 The fused figure of Skull Knightmon and Deadly Axemon, who have exchanged cups of brotherhood. 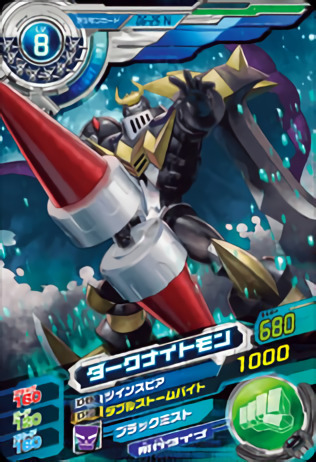 Although the skills of Dark Knightmon, who can use the "Twin Spear" it wields to thrust, slash, sweep, or throw as the situation calls for, are very advanced, it will use any means to achieve its goals, and sometimes it will even be willing to betray its own comrades. It is an opponent that you don't want to turn into an enemy, if you can help it. 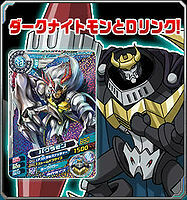 Title: 「闇の貴族」 — "Aristocrat of Darkness"
Anime/Manga Digimon Xros Wars: "Xros Pride!! A Warrior's Pride!!" ツインスピア Tsuin Supia Spinning Spear Stabs with its "Twin Spear". Choujigen Axe  Super-dimensional Axe 超次元アックス Choujigen Akkusu Multi-dimension Axe Slashes with an axe capable of breaking down the walls between dimensions. 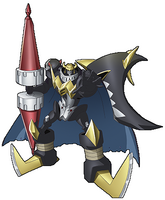 Spins its "Twin Spear" to form a vortex of darkness. 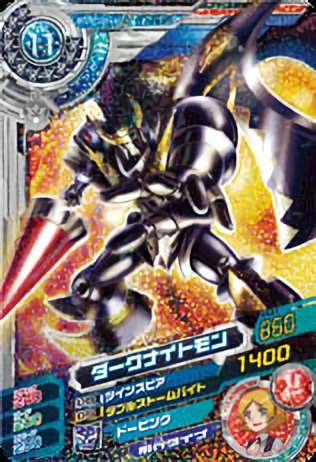 Dark Knightmon is the foremost member of Twilight. He controls Nene with the promise that he can send Nene and Yuu back to the human world. He also controlled Kiriha using a dark orb. 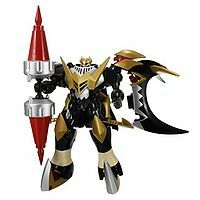 He's the younger brother of Bagramon, and he came up with both DigiXros and the D5 plan in order to defeat and overthrow his brother. He almost succeeded, but in the end met his demise in the hands of his brother. 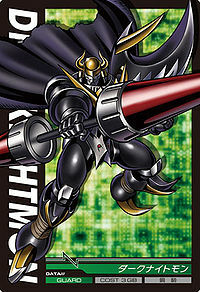 Dark Knightmon appears as one of the disguises worn by Betsumon. Miraculous Digi Xros! Shoutmon X5 Flies! Dust Zone, Grand Locomon's Great Scrap City! A New Journey!! The Great Tokyo Showdown!! Taiki VS. Yuu, the Showdown of the Boy Generals!! Taiki's Decision! Surpass the Strongest Apollomon! For the Future of the Digital World! The Friendship with the Death Generals! 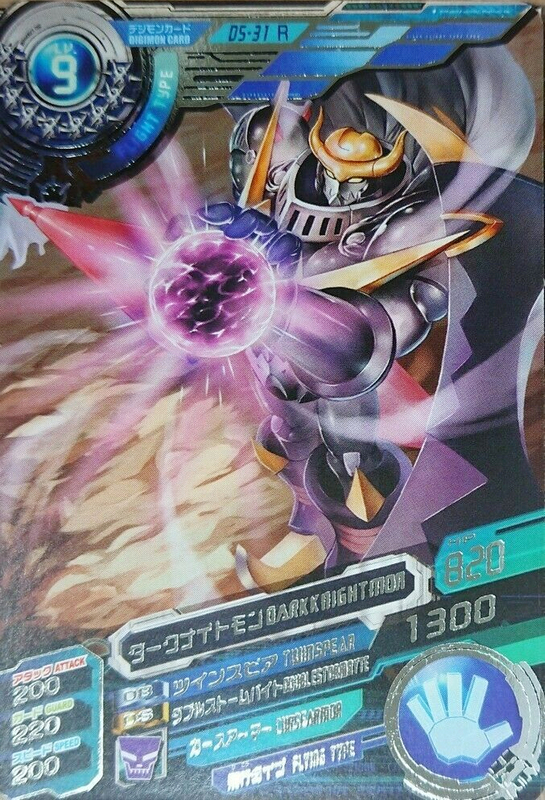 Dark Knightmon is an unobtainable Leader Digimon. 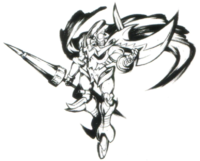 It is able to use its 'Twin Spear', a weapon transformed from Skull Knightmon's 'Spear Needle', effectively in battle according to the situation. 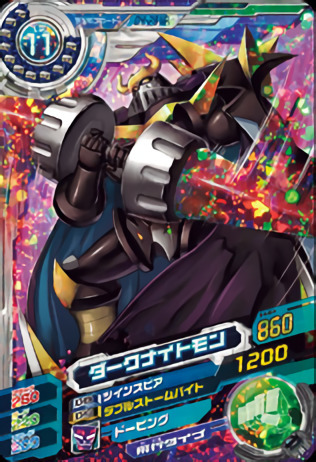 A mysterious Dark Knight Digimon from Team Twilight. It has a brutal personality and will do anything to achieve its goal. 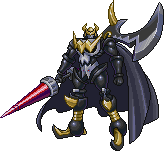 It was born from the DigiXros of Skull Knightmon and Deadly Axemon, using Nene's Xros Loader. A Digimon that will do anything to achieve its goals. It did not even hesitate to leave its comrade, Nene, behind. Its personality is such that it will do anything to achieve its goal. It used the Darkness Loader to manipulate Kiriha's spirit. Its cruelty is such that at times, it will not even bat an eye when betraying its comrades. Its skill at wielding its Twin Spear is unmistakably first-rate. 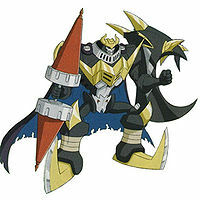 A Dark Knight Digimon that possesses overwhelming might. It rules over Team Twilight from the shadows, taking Nene's brother as a hostage. Bagramon's younger brother. After the reunification of the Digital World, it was given command of the Bagra Army and leads the Death Generals. 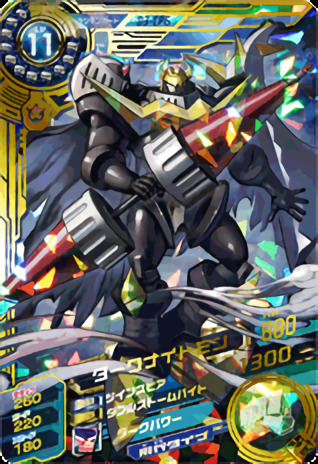 A Digimon shrouded in mystery who wears a jet-black cape. 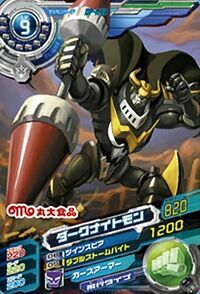 It was born from the DigiXros between Skull Knightmon and Deadly Axemon. 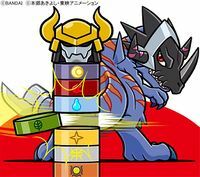 The fused form of two Digimon who have exchanged cups of brotherhood. This top-class warrior was created out of the fusion of the elder brother's intellect, and the younger brother's mobility. It will use any means necessary in order to achieve its goals. 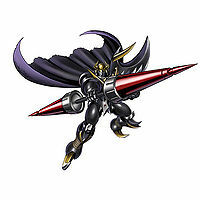 Dark Knightmon is a boss Digimon in the arcade version of the game. ↑ 6.0 6.1 6.2 Digimon Xros Wars: "Brother, Why!? The Nightmare of Enemy General Yuu"
↑ 7.0 7.1 Digimon Xros Wars: "Xros Revolution!! The Guide to Miracles!!" 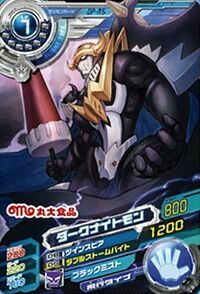 ↑ 8.0 8.1 Digimon Xros Wars: "Legendary Deckerdramon, Stir!" ↑ Super Digica Taisen: "Newsflash! 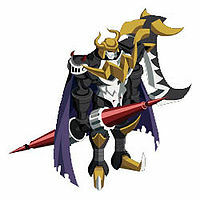 You can battle with a magnified Dark Knightmon on 01/19/2011!" ↑ Digimon Xros Wars: "Showdown! Dark Knightmon VS Xros Heart!" 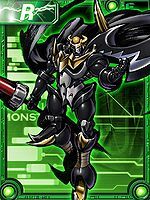 ↑ Super Digica Taisen: "EX Challenge: Dark Knightmon"
This page was last modified on 17 January 2019, at 05:09.